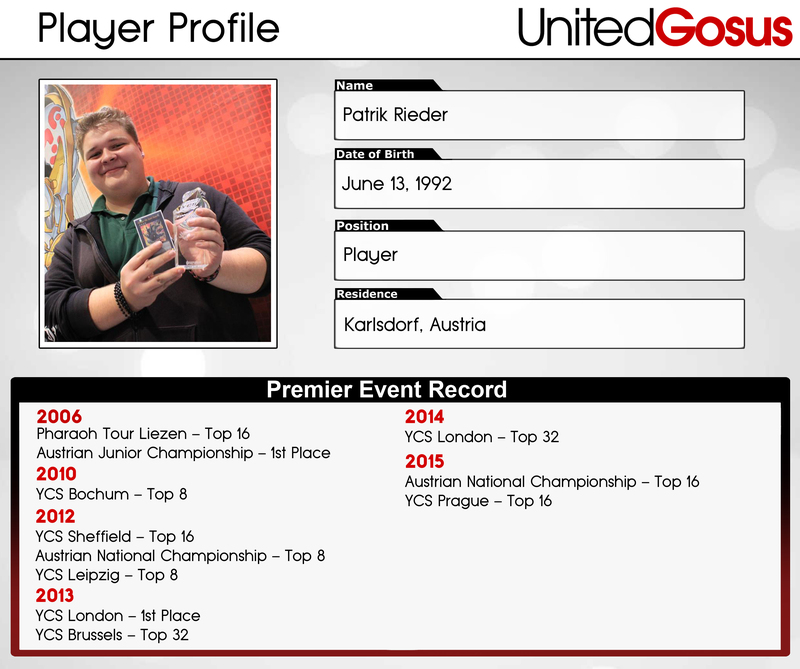 My name is Patrik Rieder, I’m 21 years old and I’m from Graz, Austria. I’m studying Medicine at the Medical University of Graz. Also I’m working part time as Tech Support at the Call Center of UPC. I love good food, enjoying a fun time partying with friends, traveling and meeting new people. When I’m not playing Yu-Gi-Oh! or discussing theory, then I’m playing Magic the Gathering or Starcraft 2. I’ve been playing Yu-Gi-Oh! since 2002, competitively since 2006 and I just love to figure out the ways to win with the top decks against everything, often most importantly the Mirror Match. The thing I like the most about traveling to Tournaments is that I get to meet my friends which I got to meet from Yu-Gi-Oh!. I’m a very observant, honest and thoughtful player, so I’ll take my time to try to figure out the best move in every situation.